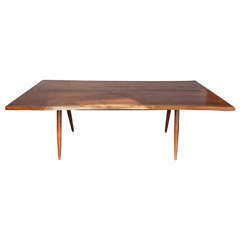 A Mid-Century Modern extension table made of walnut from Carl Malmsten. Model Gustavus. Measures: Unextended 29.5 H x 55.5 W x 35.5 D Extended 29.5 H x 102.5 W x 35.5 D. Carl Malmsten was born in 1888 Sweden and passed away in 1972. Malmsten was a famous Swedish furniture designer, architect, and educator. He collaborated with Gunnar Asplund and Uno Ahren. Malmsten having a lasting influence on Swedish design through the two schools he founded, the Carl Malmsten Furniture Studies. Early 20th century French table. 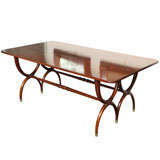 This Art Deco table was produced in France. 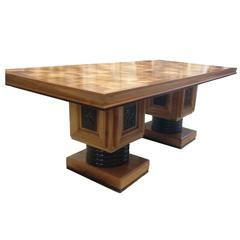 It is made from solid walnut and has an inlaid top and carved legs. 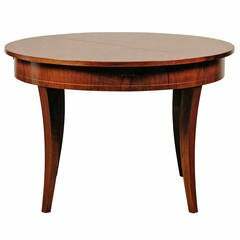 Early 20th century walnut dining table with double curule shape legs with turned cross stretcher. Beautiful color and patina on this dark, solid oak, early 20th century trestle table from England.